Synopsis is a visual programming and rapid application prototyping tool for designing and developing Windows applications. 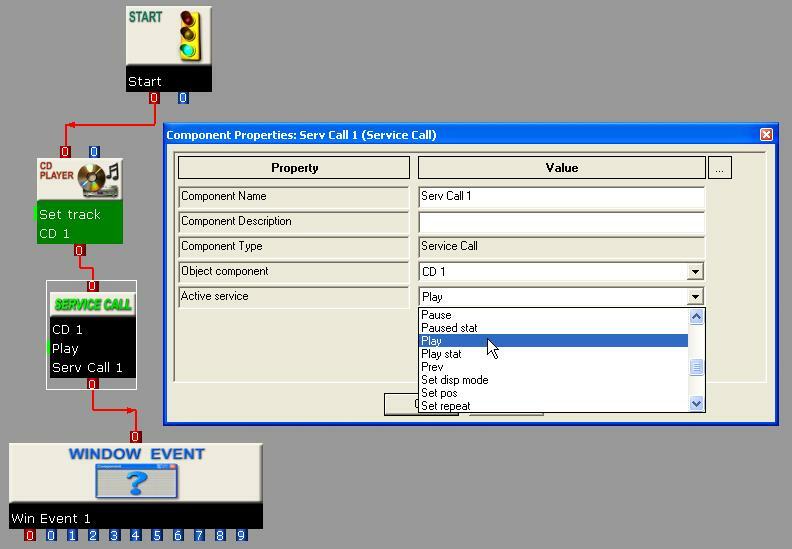 Software components are represented by graphical icons that can be quickly connected to build even complex programs. Base components cover various application areas including user interface, multimedia, file I/O, etc. You can connect to your own DLLs and SQL databases to reuse existing software tools. Synopsis allows for real-time programming where changes can be made while a program is running. This allows for instantaneous feedback without the need to leave the development environment. Synopsis can even build final executables (.EXEs). Use Synopsis to quickly connect visual representations of software components to rapidly build a complex application. In the example at right, we have a complete program created with only four components which streams audio from the CD-ROM of the computer. To see some programming examples using Synopsis, click here. Save on learning and development time using Synopsis' visual methods: Free yourself from having to know all of the low-level programming details so that you can concentrate on designing your applications. With Synopsis, no traditional computer programming is necessary. Graphical interfaces are used to assemble software applications several orders of magnitude faster than traditional textual programming. Start programming applications immediately: Short learning ramp-up times mean that in a matter of minutes you will be creating programs. Benefit from a robust and stable development toolset: Save even more development time by benefitting from Synopsis' array of stable and well-tested software components. Get application breadth but keep ease of use: Use Synopsis for a wide-variety of programming tasks: from user interface prototyping to multimedia, etc. But no matter what application you need to produce, the way in which you use Synopsis and its software components remains the same and is easy to understand. Avoid having to re-invent the wheel: Accelerate your program development by re-using your own existing software components (DLLs) and integrating them into your Synopsis programs. Rapid application development: Make program changes easily and often without the need to rebuild low-level software components: this translates into much faster development cycles and product delivery times. Catch program design errors much earlier in the development process. Real-time programming: Modify the behaviour of your program while it is running. This increases development efficiency and productivity throughput. Ability to build standalone executables (.EXE) applications. More than 110 components offering more than 1500 services covering a range of programming areas, including multi-media, database, programming logic, math & financial and web. 24 traditional Windows user interface components including: Buttons, TextBoxes, RichTextBoxes, Labels, Panels, Groups, TreeViews, ListViews, Splitters, TrackBars, ListBoxes, Radio Buttons, etc. Ability to harness existing functions exposed in standard Windows DLLs. This enhances code reusability and integration. Control external Windows applications with macro commands. Communicate with external devices using serial port interfaces. Create multi-media applications using DVD, CD, Image and Audio components. Example programs and detailed help modules to help you familiarize yourself with the Synopsis feature sets. Synopsis' Software Component Package (SCP) plug-in technology allows for the seamless integration of new software components to augment programming depth and range.